compelling works from the history of art, literature, and ideas. Such a delightful surprise to find a new site that offers a magazine which will delight the bibliophile. Shared here are a few samples of the Book Covers that have been displayed on the site. All credits and any explanation needed are given beneath the displayed covers. And very delightful these creations are. Enjoy! If you would like to explore further, click on the “online” in the first paragraph above, and go directly to The Public Domain Review. The house and James were visited by the likes of Miles Davis, Nina Simone, Stevie Wonder and more. This from back in the day when artists gathered for informal salons not called anything but visits. As was it the same when Gertrude Stein held court in the rooms of her home, and Alice B served the company. The article is well written, as are most all of the Lit Hub publications. Zaborowska writes well and includes enough tantalizing information to make us search out the book. (It has been immediately added to my wish list.) Make no mistake, though, it is not about literature or the oeuvre of Baldwin. It is about the architecture, and its destruction, and its loss. PLACE looms large for both the writer (Baldwin) and visitors. 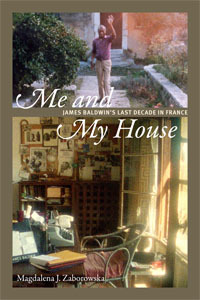 Inside the house—Chez Baldwin, in the south of France. 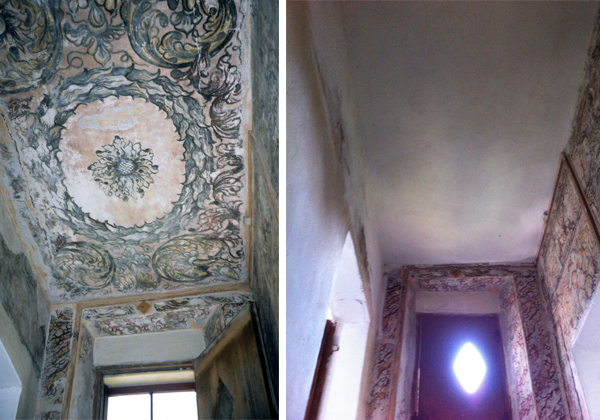 The ceiling in 2000 and 2014. Photos by Magdalena J. Zaborowska. I first encountered the writing of Baldwin in Giovanni’s Room, several years ago. As has often been the case for me, it was an accident. One of those: it looks interesting, oh what the heck, might as well buy it. At that point I had not heard of the man, or anything he was about. He was well known in literary circles, but not close to any circles of mine. I soon became a fan and began the read of what was already out, and the books, essays and social commentary that followed. James Arthur Baldwin was born in Harlem, New York city, in 1924. He died of stomach cancer in 1987, at Saint Paul de Vence, France. He is now considered of major importance in the voice of racial, sexual, and class distinctions, and a major writer of the 20th century. The LitHub has a lovely article about the book. It’s direct quotes from the original reviews and worth a look. It has made me want to read it, and I missed it the first time around. Actually that happens with me a lot. Somewhere inside of me lies hidden the critic who says, “Let’s just wait a while and see how this holds up.” Especially if there’s a movie associated with it. Never trust the movie, I say! Ever wondered what your name would sound like as a musical motif? You can now find out using Clarallel, an algorithm that reveals your musical cipher. Musical ciphers (which are means of transforming text, usually a name, into a musical motif using logical relations between letters and pitches) have been used by Western composers for centuries. Even though Western musical notation uses letters for pitch names, this only works for the letters A to G. Therefore, in the past composers have struggled to find a logical method for the other letters. For example, in one piece, the composer Robert Schumann created a melody out of his wife Clara’s name. The letters C-l-a-r-a became C(#)BAG(#)A. For the letters c and a, Schumann used the logical pitches C(#) and A. For the letters l and r, he simply assigned the pitches B and G(#), as they make melodic sense of the surrounding pitches. Kai Konishi-Dukes has developed an algorithm building upon the above method which turns your name, or anything else you write in the box, into a little musical ditty. He’s called it Clarallel. Above is C-l-a-s-s-i-c-F-M in a minor key, then in a major key. Sounds fun, doesn’t it? What does your name sound like? Give it a go here. Having returned to Frankfurt from Leipzig University in 1768, Johann Wolfgang von Goethe began studying the alchemical writings of Paracelsus and Basil Valentine and performing experiments in his own laboratory. The poet, statesman, playwright, novelist, and scientist began his masterwork Faust around 1771, publishing Faust: A Fragment in 1790 and Faust: Part One eighteen years after that. We have a book of Goethe’s poetry here. It’s in the TBR pile, where it is likely to remain for the rest of my life at the least. Although I do reference it upon occasion, flipping through it to find something of interest. That is done in an easy frame of mind. Not the mad passionate one of the search for the perfect—in a book where you know it will be. Nightwood, Barnes’ best novel, has the distinction of being the only lesbian-themed Modernist gem to garner praise, and an introduction, from arch-conservative T.S. Eliot. Before writing it, Barnes was born in a log cabin, raped as a teen, and lived as a Bohemian journalist in Greenwich Village. She was ahead of her time in just about every way possible, even pioneering the kind of New Journalism that wouldn’t catch fire until mid-century. A poet, novelist, playwright, and illustrator, Barnes exemplified both the glory and isolation that come with being a perpetual outsider. Hemingway wouldn’t have known what to make of her. This from Book Riot’s piece on “Five Women Writers Tougher Than Hemingway,” which is why the ending sentence is a reference to Hem. And so of the day, to make much of the lovely Djuna. And there is so much more to say about her. But I must go look for the book.